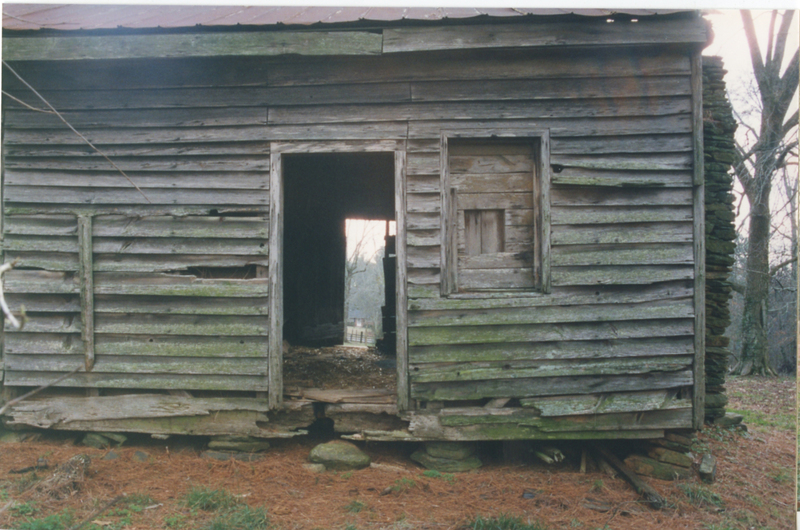 Unless otherwise noted, all photographs here were taken by Tommy H. Jones in January 1998. This is part of a series of historic structure reports on the historic architecture of Georgia and the Southeast by Tommy H. Jones. Unless otherwise noted, all photographs are by the author. This report is posted here for educational purposes only and may not be used or reproduced for commercial purposes or without the express permission of the author. Figure 1. The Hudson-Nash House, with the detached kitchen visible at right. The front gables were added in 1911. Figure 2. 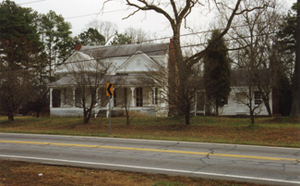 View west of Hudson-Nash House in 1998. 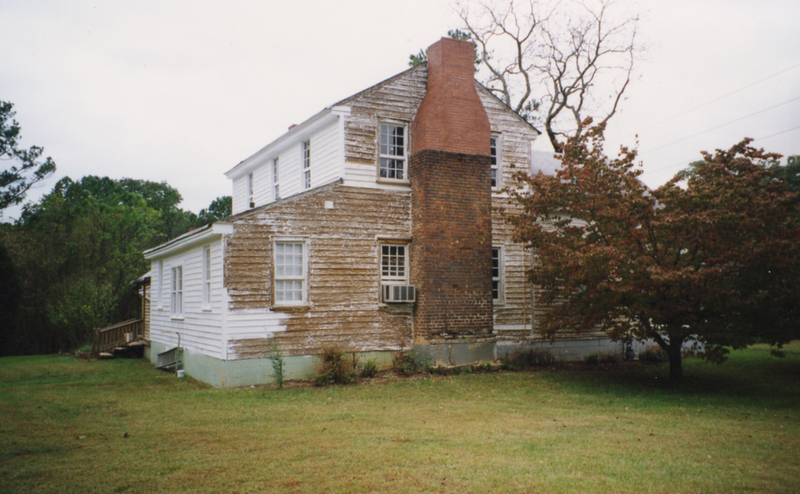 It was built in the plantation-plain style around 1840 and remodeled in the 1880s. The existing 5.166-acre site is but a fraction of the original Hudson-Nash farm which, at its largest extent before the Civil War, included 562 acres in Land Lot 88 and stretched to Turkey Creek in Land Lot 85. In spite of its small size, the present site contains seven of the eleven structures that were included as being a historically significant part of the Hudson-Nash farm’s listing in the National Register of Historic Places. All are located along the highest ground of the property, which was historically bisected by a farm road that led to the cultivated fields to the north of the present site. 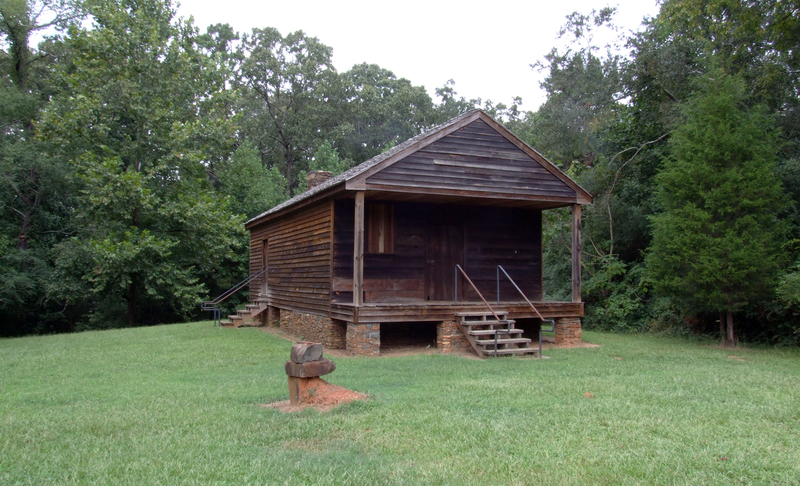 The slave house and, in particular, the store/Post Office, were oriented toward the Hudson-Nash House, making observation of any traffic around the store quite easy. In 1999, the structure was moved a hundred feet from its original site and heavily reconstructed by Gwinnett County. In addition to replacement of most of the exterior woodwork, several aspects of the historic building were altered at that time, including large square piers in place of the original stacked stone piers and a significantly different detailing of the gables. Figure 3. 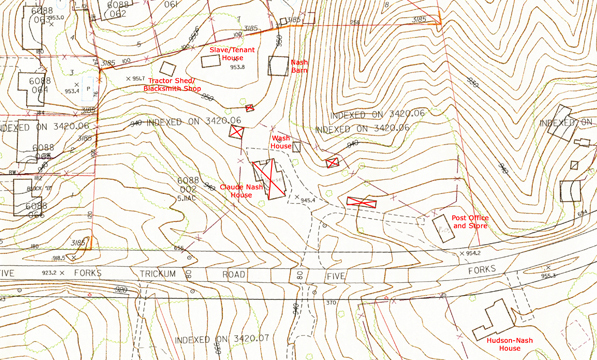 Detail from 1990 topographical map of Gwinnett County, showing the part of the historic Hudson-Nash Farm that survives north of the public road. The structures marked with an "X" are no longer extant. 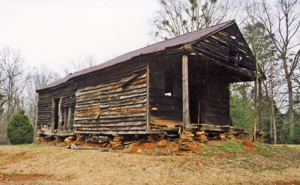 The named structures contribute to the significance of the National Register of Historic Places historic district and have been retained by the County. Some of the smaller structures no longer exist. One of the most significant features of the landscape is the old roadbed of Five Forks-Trickum Road. Laid out in the 1840s, the road was originally a typical rural wagon road that meandered gently with the contours of the land. Many of these roads remained mostly unimproved from that poor condition until well into the twentieth century. With the increasing importance of the automobile after World War I, some road improvements were made in the 1920s but many rural roads remained unpaved until after World War II. 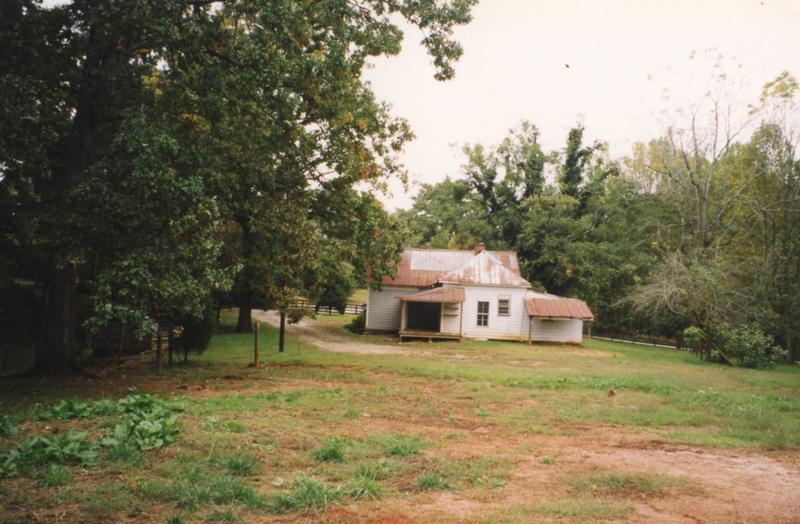 In 1939, the route of Five Forks-Trickum Road was straightened and paved, which necessitated destruction of one of Hudson’s old slave houses, then being used as a Tenant House by the Nashes. 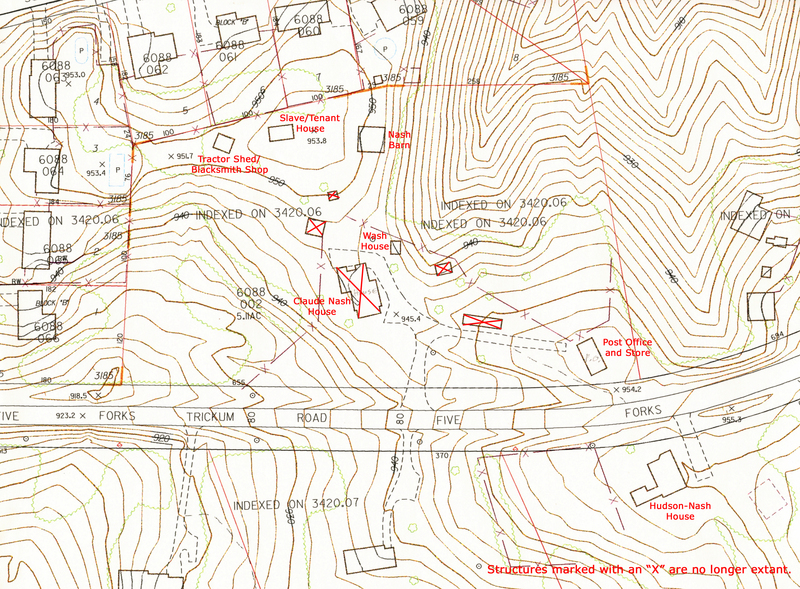 The abandoned roadbed was deeply cut and the steep banks still mark the north side of that roadbed to the west of the Claude Nash House and, to a lesser extent, just west of the store/Post Office. 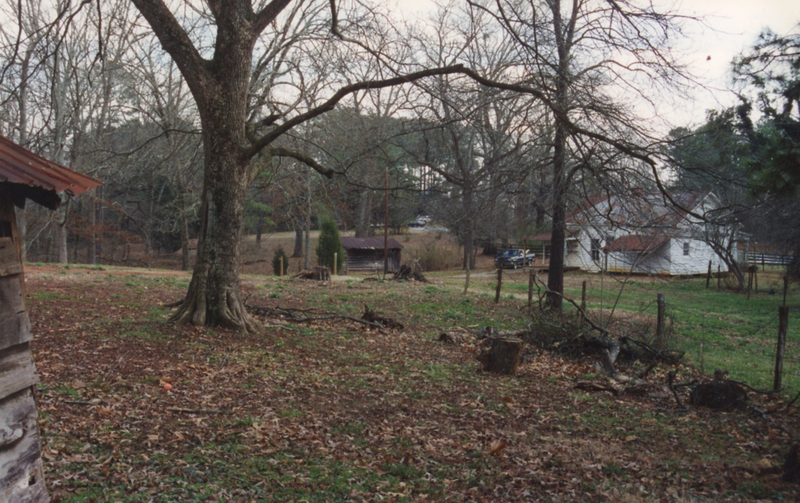 In front of the Nash house, the old road bed was filled to the existing grade in 1939. During the nineteenth century, most of the site was probably cleared and under cultivation or else taken up with outbuildings associated with the historic farm. 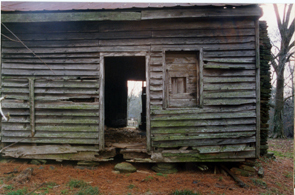 A few shade trees might have been left around the store/Post Office, the slave/Tenant House and the other outbuildings but most of the remainder of the present site was probably cultivated or used for pasture by Hudson and, later, Nash. Livestock, especially hogs, were often left to roam and forage for themselves during the antebellum period, but fence laws in the late nineteenth century necessitated the widespread use of the all sorts of wire fencing, barbed wire being one of the most popular. 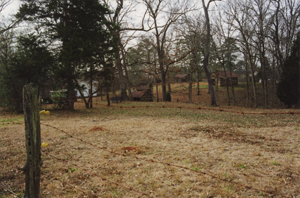 In addition to the modern ornamental board fence that lined the driveway to the house in 1998, a variety of wire fencing criss-crossed the site, some of it older barbed wire fencing and some of it modern wire and electrified fences. Along the lower bank that formed the south side of the old road bed near the western end of the property is a barbed wire fence that predates the 1939 changes to the road and there are other remnants of early barbed wire fences on the property. Traditionally, these fences created lines of demarcation between the front yard, kitchen yard and Barn yard while also being used to enclose pastures and other such areas. Figure 4. View east from blacksmith shop, with slave/tenant house and the barn beyond. Figure 5. View northwest from the west side of the post office. The Claude Nash House is barely visible at left. Figure 6. View southeast from blacksmith shop. The Claude Nash house is visible at right. North of the Post Office and again north and west of the Claude Nash house, pastures have been maintained until fairly recently, although only the fence around the pasture behind the store remained mostly intact in 1998. 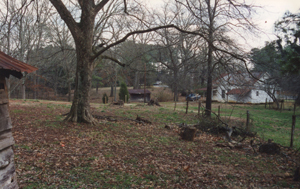 The old Barn yard area between the Claude Nash house and the Barn is badly eroded and there are isolated eroded areas near the Store and at the west side of the property. The pastures and most of the yard around the house are grassed. Behind the store, the ground falls away sharply in a ravine that deepens toward the northeast corner of the site. Deeply eroded in the nineteenth century, the northwest side of this ravine was most likely the “red clay bank” that Hudson’s Guards used for target practice during the Civil War. Today the ravine is heavily wooded in mature, second-growth oak, hickory, cedar and other native trees, with minimal undergrowth present. There is perhaps an intermittent spring or branch that forms at the bottom of this ravine in wet weather. 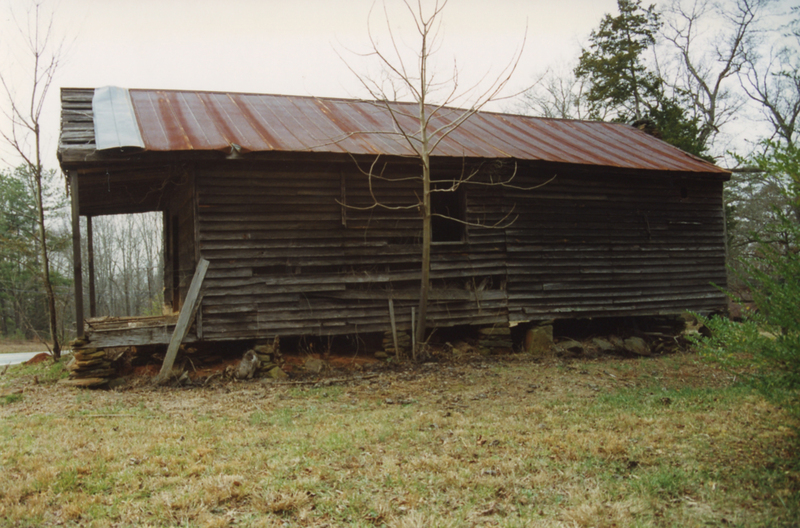 The existing Barn (see below) was built on part of Claude Nash’s vegetable garden, according to his daughter. A low stone wall set a few feet east of the Barn was probably built to create a level terrace on which to plant that garden. 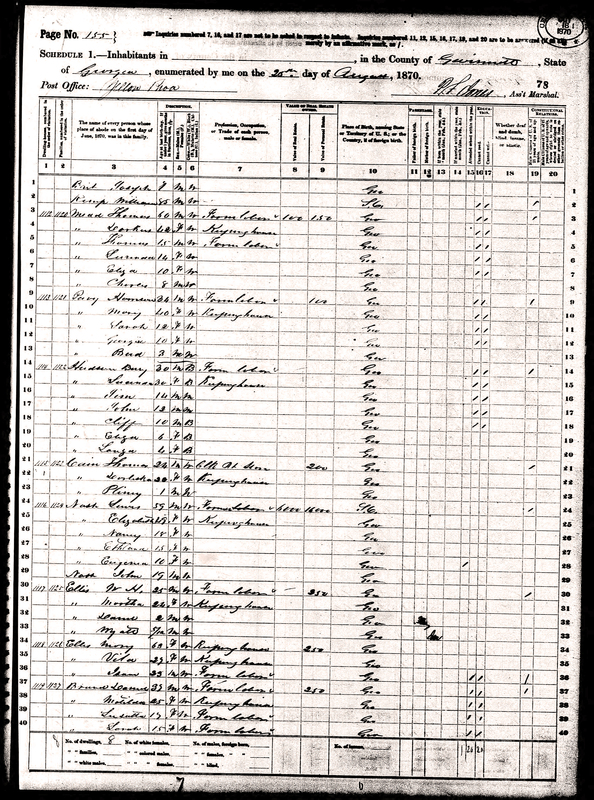 Fruit and nut trees were also typically found on the farmstead and the Hudson-Nash farm was no exception. Three old apple trees, several fig trees, and a black walnut tree can be found on the west side of the house and a large pear tree near the wood shed. Claude Nash planted these in the early twentieth century according to his daughter. There are thought to have been at least three wells on the present site, all of which have been filled and covered. The oldest of these, and certainly the most interesting from an archaeological point of view, is located on the west side of the store/Post Office and was probably a nineteenth century well. 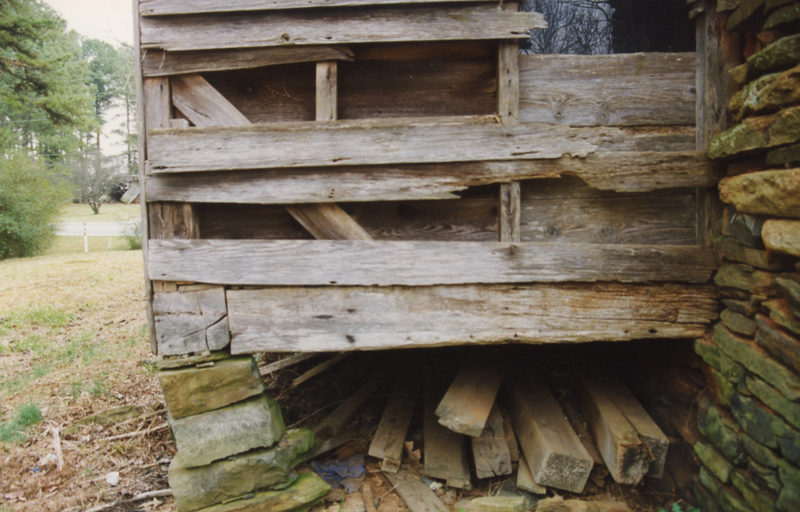 The other two wells were located near the Nash house, one beneath the back porch and one behind the house. All of these have been filled. There are at least three generations of buildings on the site. 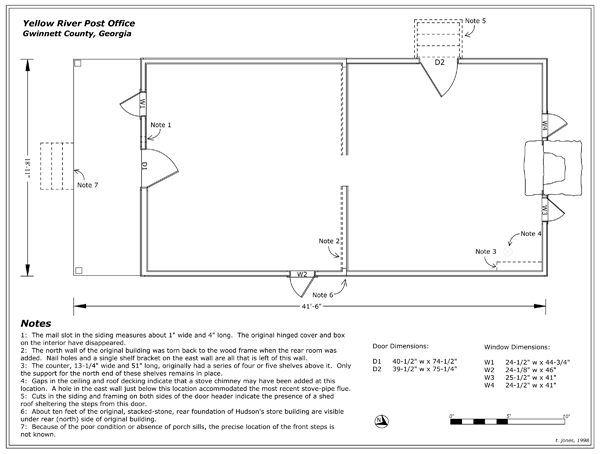 The oldest structures are the Store/Post Office building and the Slave/Tenant House, both of which were constructed before the Civil War (see site plan below). The remaining structures were constructed after 1912, some utilizing materials from earlier buildings. Although the Claude Nash House (c. 1913) was not included in this investigation and had undergone several modern alterations, it appeared to remain in relatively good condition in 1998. 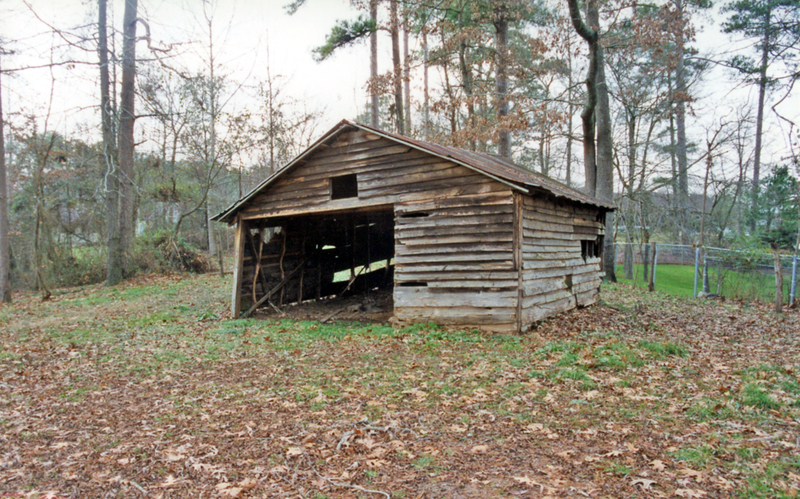 Most of the other structures, including the Post Office, are deteriorating, with the wood shed being on the verge of collapse. Following is a description of each of these buildings. 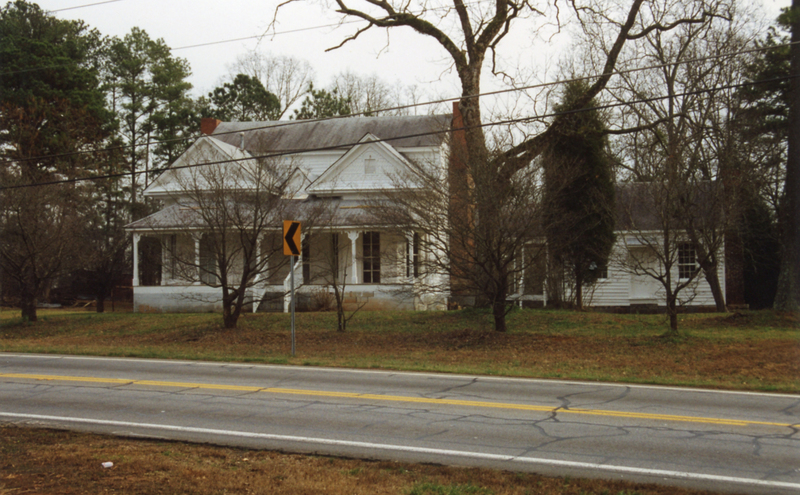 Located near the southeastern corner of the property and facing south-southeast and Five Forks-Trickum Road is the building that served first as Hudson’s store and, after 1846, as the Yellow River Post Office. Expanded prior to the Civil War, the building was used as a residence in the late nineteenth and early twentieth centuries, although few alterations appear to have been made to the building in order to accommodate the new use. The building has apparently never been wired for electricity or had any sort of plumbing installed. Figure 7. Front (south side) of building. Figure 8. Front and west side of building. Figure 9. West side of building. Figure 10. Rear (north side) of building. Figure 11. Rear and east side of building. Figure 13. Front and east side of building. Figure 15. 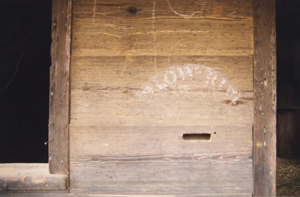 Mail slot and faded lettering "Yellow River Post Office" on front porch. 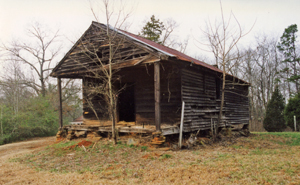 The two-room building measures about 41’-6” long and 19’ wide and has an end-gabled roof that shelters a full-width front porch. The front or south room of the present structure was constructed first, perhaps as early as 1838 or 1839, most likely around 1840, and certainly by 1845. Perhaps as early as the late 1840s but probably in the 1850s, the original structure was nearly doubled in size, probably to accommodate Hudson’s growing mercantile business. Both parts of the building are of similar design and construction and were also finished with similar materials, indicating that the addition was made prior to the Civil War and not, as has been suggested, in the late nineteenth century. 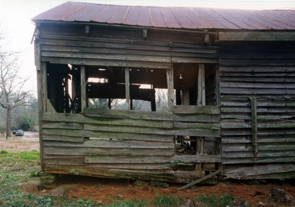 Although there were several subsequent modifications and parts of the present building are badly deteriorated, enough evidence has survived to document most details of the original building and the historic addition. 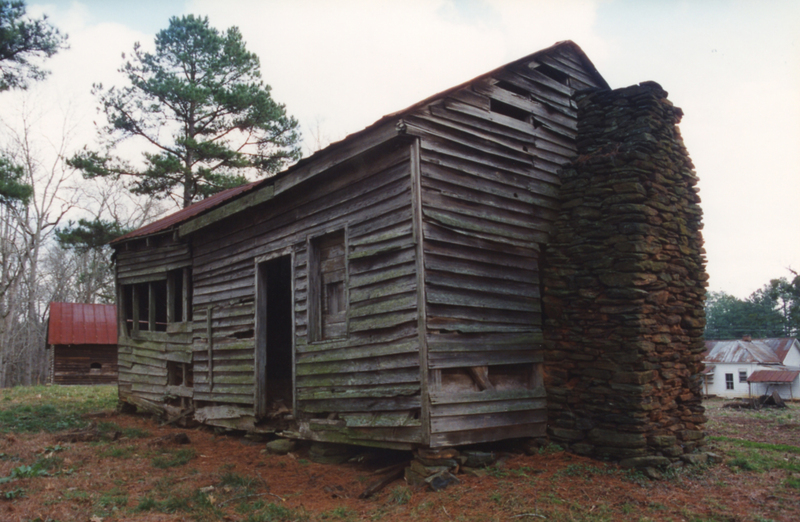 The building is set on stacked, field-stone piers in a manner typical of Georgia’s rural vernacular buildings of the nineteenth century. The piers have been altered and repaired over the years and those around the southwest sides of the building have been severely undermined by erosion. 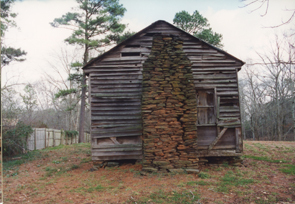 The original, one-room Store/Post Office building apparently was built on a continuous foundation of stacked field stone, except perhaps for the front porch. Part of this original foundation survives under what was the rear (north) wall of the original building. The stacked stone piers of the addition used stones that were generally larger than that used for the original foundation. Both parts of the existing building were constructed with a braced, wood frame that is typical of the mid-nineteenth century. 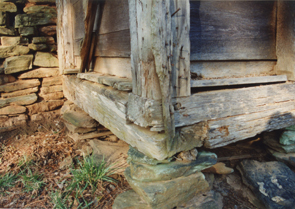 Sills are hewn, measuring about 11” x 13” in the original building and 10” x 11” in the addition. 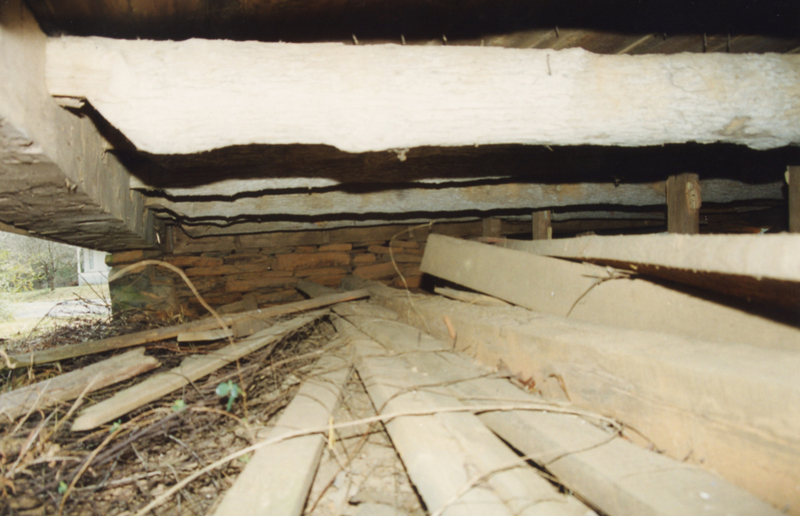 In the front half of the structure, floor joists are a mix of split and whole logs, mostly oak, and hewn flat on the top. 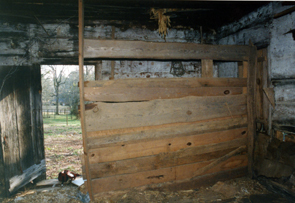 In the rear, joists are whole logs, poplar or hickory, hewn flat on top but with bark left intact. 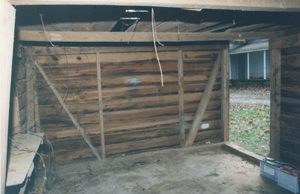 Studs for walls are generally slightly less than 3” x 4”, with those in the rear addition more irregular and slightly smaller than those in the front part of the building. 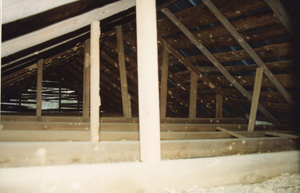 Ceiling joists are generally 3” x 6” in both parts of the building but, instead of the 3” x 4” rafters used in the original building, round pole rafters were used for the roof of the addition. 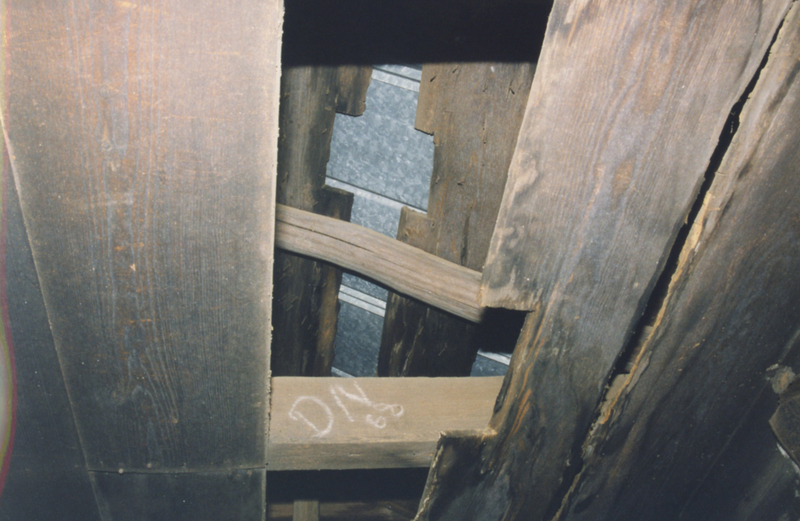 Framing connections are generally made with mortise-and-tenon joints, with the use of cut nails noted only in the attachment of studs to the cross-braces at the corners of the addition. 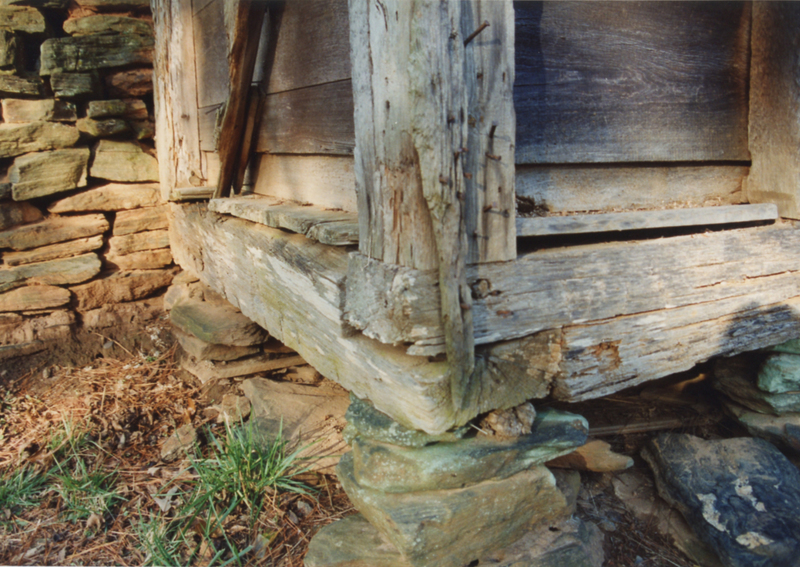 Except for the hewn sills, all framing material is sash sawn which, with the character of the framing connections, is another indication that the addition was made prior to the Civil War. The roof is now covered in 5-V metal roofing but would have been originally wood-shingled. 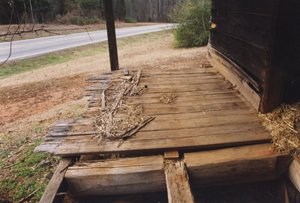 What appears to be the original sawn-slab roof decking remained on the building in 1998. 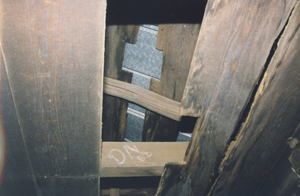 A few split oak shingles were observed in the attic but these were installed with wire nails, indicating that they were perhaps debris from a second or third wood-shingled roof covering in the late nineteenth-century. 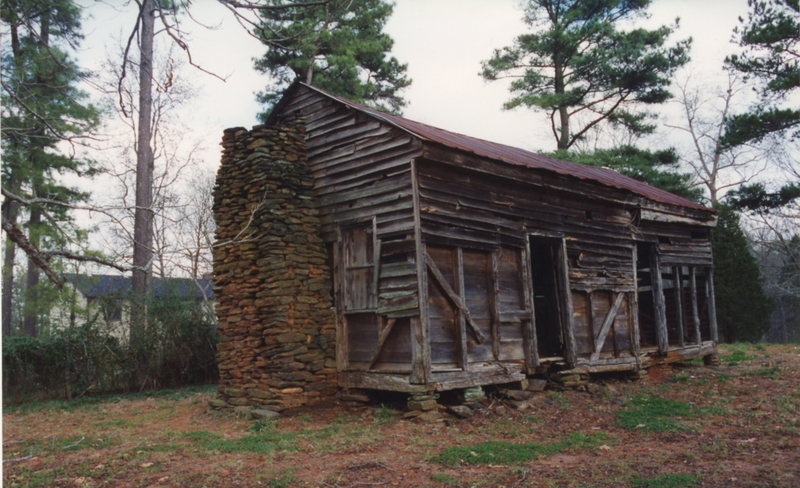 The original roof shingles may have been quite similar. Except in the front porch, siding is sawn, approximately ½” thick and 6½” wide, lapped with an exposure that varies from 5½” to 5¾”. Much of the original siding remains in place, with a few exceptions. On the west side, all of the original siding has been replaced on the front half of the building, except for the three or four runs at the top of the wall. 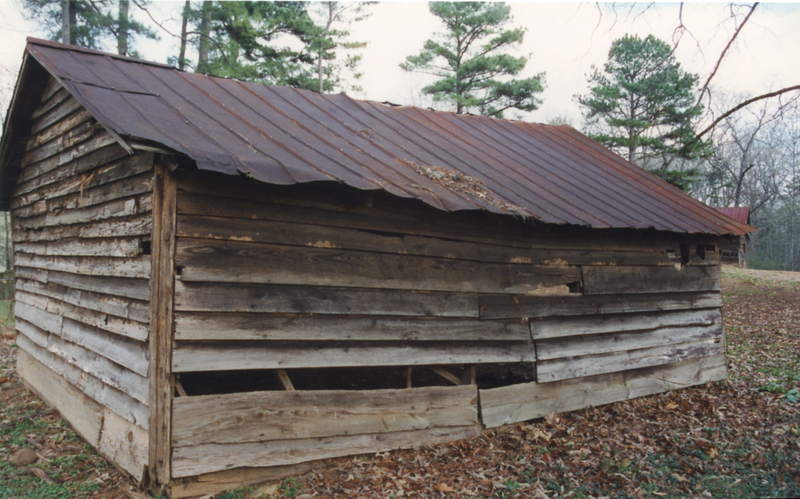 Replacement siding can be generally identified by the use of wire nails, rather than cut nails as was used in the original. 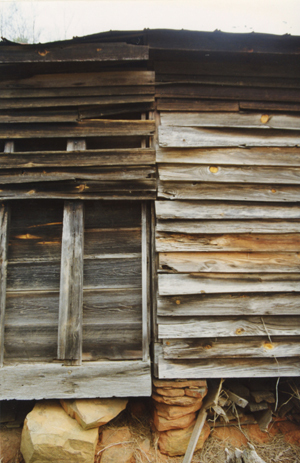 The replacement siding is in poor condition, generally because its quality did not match that on the original building. On the rear half of the west side, much of the siding has been removed on the right side of the door and siding is also missing across the lower side of the north end and in a few locations on the east side and in the front gable. Original siding was quarter-sawn pine, an exceptionally durable material even when never painted, as appears to be the case with nearly all of the exterior woodwork of the building. The front of the store and the ceiling of the front porch are covered with tongue-and-grooved boards that range from ¾”-1” thick and 10”-11” wide. 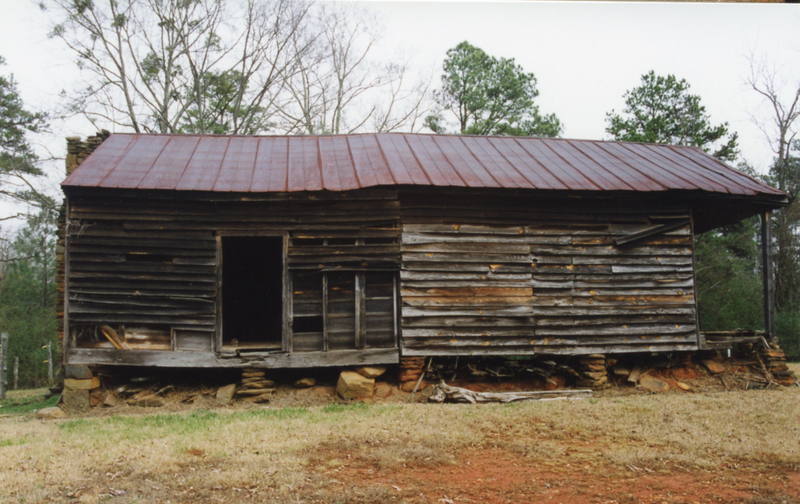 The use of flush siding on the front of a building is a typical feature of many antebellum buildings. 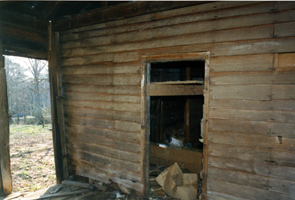 The building has two door and four window openings, with only slight differences between the detailing of the door and window trim of the two parts of the building. 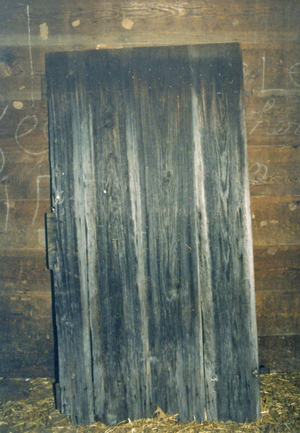 The two doors are intact but only one of the original board-and-batten window shutters has survived. 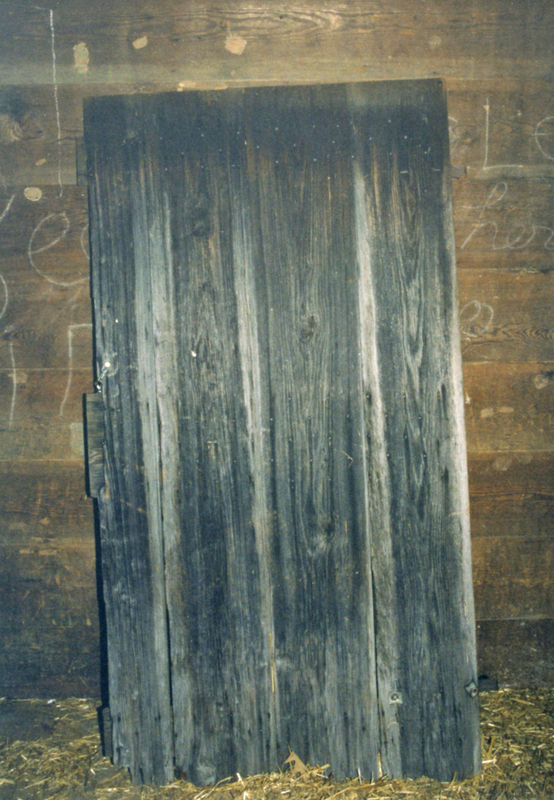 Both doors and shutters were constructed of tongue-and-groove boards with chamfered battens attached by cut nails. The hardware on the front door is especially remarkable. The wrought-iron latch and the wrought-iron pull, which is decorated by a pair of cast-lead shells, are original, as is the rim lock and its very unusual wooden cover. None of the windows appear to have ever had sash and window glass. In addition to the metal hinges, wrought iron hooks for shutter latches are visible at all window openings, which also have holes that were apparently made for later sliding barrel latches that have now disappeared. Figure 16. View of connection of original building, right, and the early addition, left. Figure 17. View of chimney at rear of building. Figure 18. View of chimney top. Figure 19. View of sills and framing at northeast corner of building. Figure 20. View south of floor framing of original portion of the building. Figure 21. View west of original front foundation. Figure 22. View west of front porch and framing. Figure 23. View south in attic with pole rafters of rear addition visible in the foreground. Figure 24. View of cuts made for stove flue at southeast corner of rear addition. Figure 25. 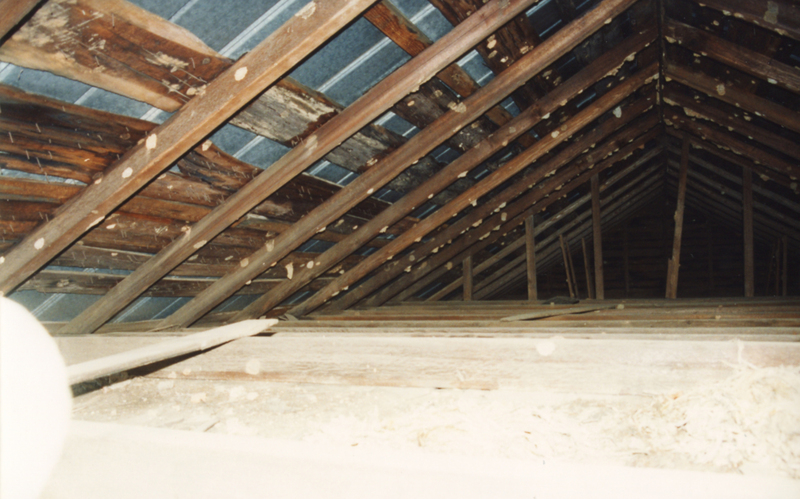 View north in attic, with saw rafters of original building visible in foreground. Figure 26. View of exterior side of door on west side of addition. Figure 27. View of inside of door on west side of addition. Figure 28. Interior of window opening to front porch. Figure 29. 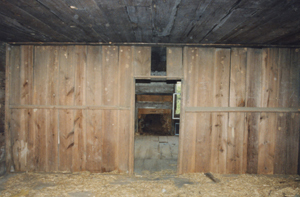 View of interior of window at rear of addition. Figure 30. View of southeast corner of rear room. Walls and ceilings in both parts of the building are finished with tongue-and-grooved, hand-planed boards, generally ¾”-1” thick and 10”-11”wide, similar to those used on the front porch. Attachment is made with cut nails, with those on the front of the building and on the ceiling of the front room being L-headed and the remainder having common heads. Flooring is plain boards, ranging around eleven inches in width. 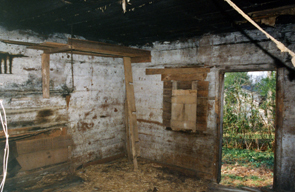 The original one-room store house must have been heated by a wood stove, if at all, since there is no evidence for the existence of a fireplace for that part of the building. 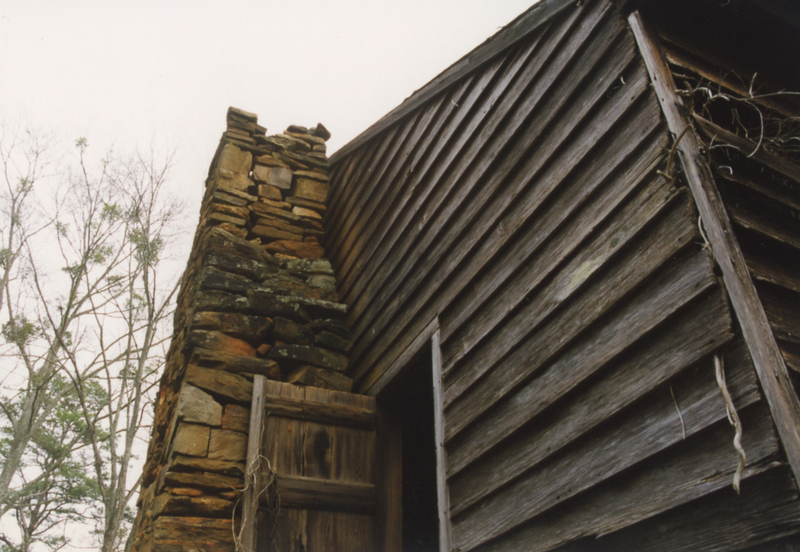 The addition, however, included a field-stone fireplace and chimney at the north end of the building and there is also evidence for the presence of a stove-pipe through the roof in the northeast corner of the addition. Although a stove probably heated the building in the late nineteenth century, the fireplace is likely to have been the only source of heat throughout the antebellum period. 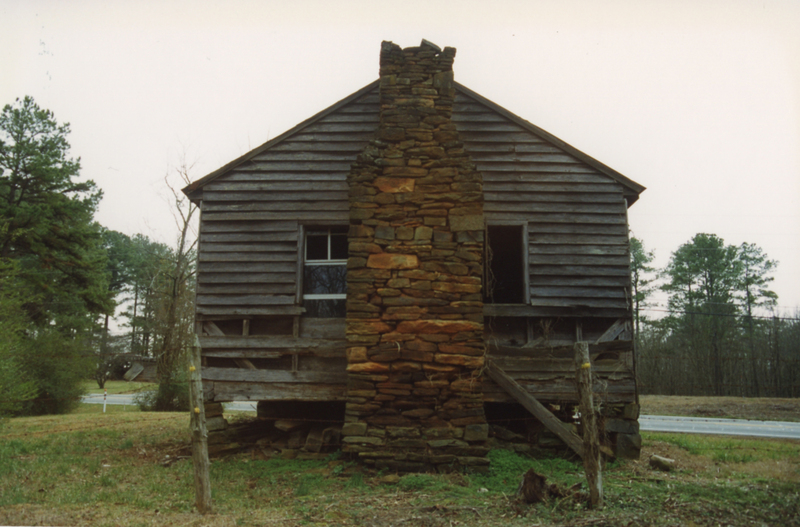 The fieldstone chimney was constructed using a clay-based mortar that has now largely eroded away. The masonry structure of the chimney is deteriorated, with stones missing from the left side and face of the firebox. Although the mantle shelf has been broken and two or three boards have been removed from the fireplace surround, the character of the original detailing is evident. 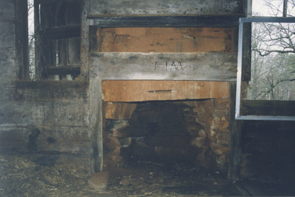 The mantle shelf was probably a single board, ½” x 6” x 59⅛” with chamfered corners and was set 64” above the stone hearth. Figure 31. South (front) wall of original portion of building. 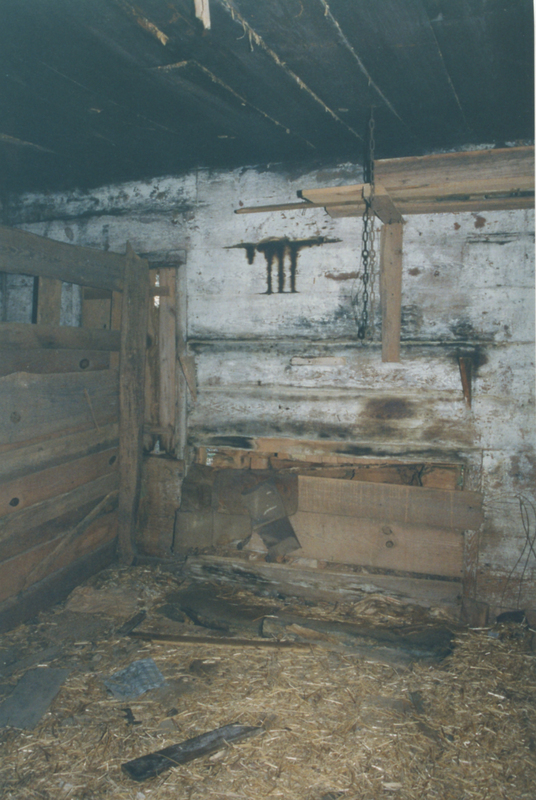 The interior partition wall between the two rooms may not have been added until the building ceased to function as a store, perhaps in the 1870s. It is likely that the complete removal of the original rear wall of the store, including the studs, was done to create a single large space for the store and Post Office and that when the building was turned to residential use in the 1870s, the partition wall was erected. Consisting of 1” x 10” boards installed vertically on one side only of an open 2” x 4” frame, this wall has a single door opening. The opening appears never to have been hung with a door but was covered by a curtain hung on a wooden rod, the scrolled bracket of which is the only element that survives. 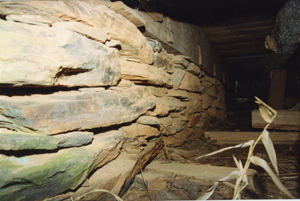 Most of the walls appear not to have been shelved, not surprising since most of Hudson’s antebellum trade would have been in bulk dry goods sold out of barrels and sacks. What appears to have been a shelf bracket survives to the left of the east window in the front room, indicating that there were one or more shelves on the original rear wall of this room. 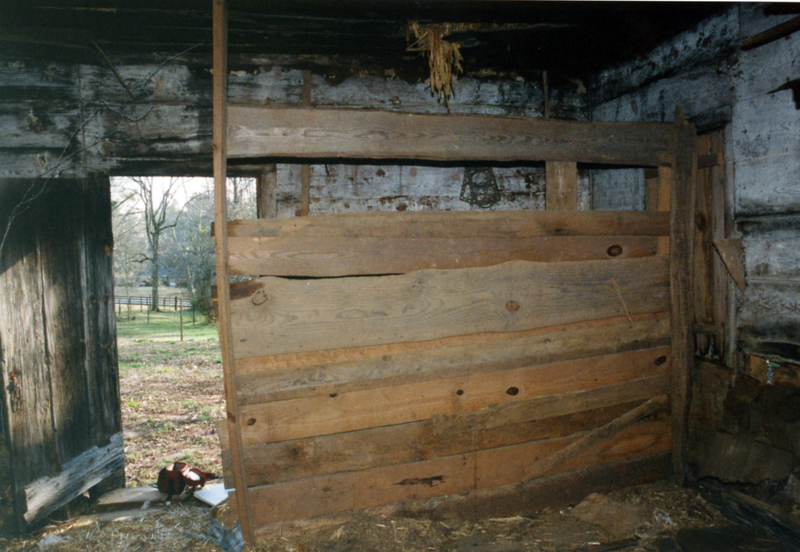 Part of what was probably shelving for the antebellum store survives along the east wall of the rear room. It consists of a counter-top measuring approximately 13” x 51” set at 37” from the floor and surmounted by a single board that originally supported four or five shelves. The original length of the counter and these shelves probably extended to about ten feet, where part of the end support is still in place. Except for the front porch, the front (and oldest) part of this building is in relatively good condition. 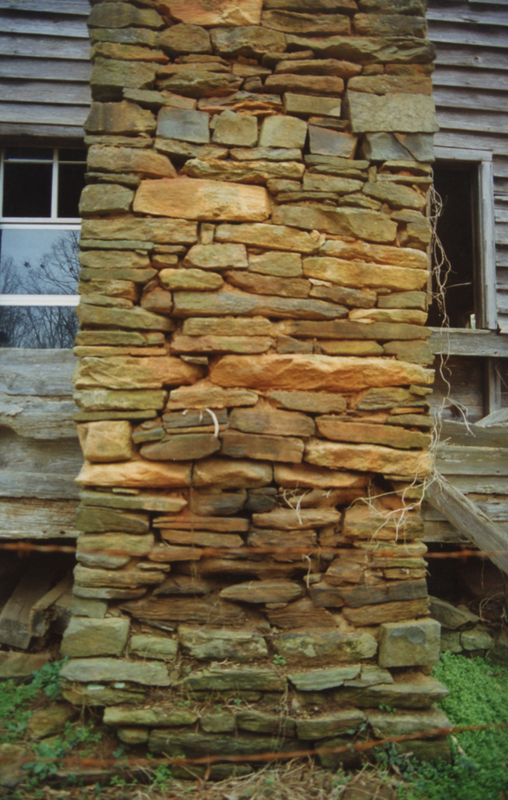 The rear addition is badly deteriorated, mainly because of erosion around and collapse of the stone foundation piers and deterioration of the sill on the west side of the building. The front porch floor system is in poor condition. Figure 32. Northeast corner of front (south) room. Figure 33. Northwest corner of front (south) room. Figure 34. North of front (south) room. Figure 35. North of rear (north) wall of addition. Figure 36. Fireplace in rear room. Figure 37. East wall of rear room. Figure 38. View northeast in 2010. Figure 39. View northwest in 2010. Figure 40. View south in 2010. 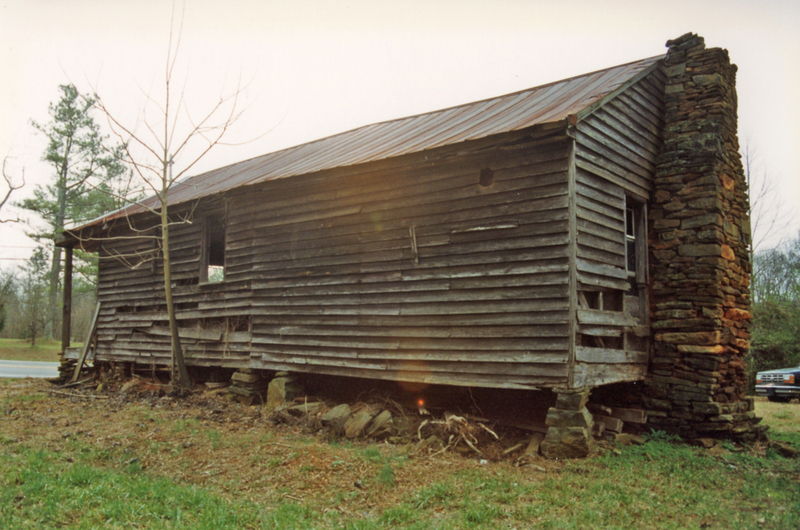 Located near the north property line and facing in a southerly direction, this building was probably one of the two Hudson slave houses documented in the 1860 census. 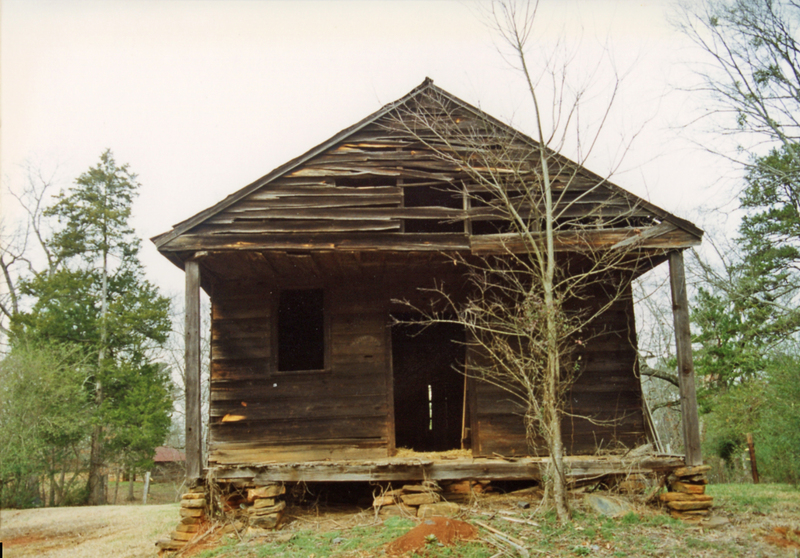 After the Civil War, William T. Nash rented the house to tenants but, at least by the 1920s, it ceased to be used as a residential structure. There is no documentation for the suggestion that this building was built by Hudson as a “loom house.” Such a specialized building would have been quite unusual on a farm such as Hudson’s. 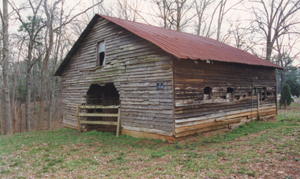 The building was last used as a barn for animals. Figure 41. View northeast of Slave/Tenant House. Figure 42. View southeast of Slave/Tenant House. The original building consisted of only the present west room, measuring about 16’ x 18’, a type of vernacular building that was common across the Southern landscape in the first half of the nineteenth century. 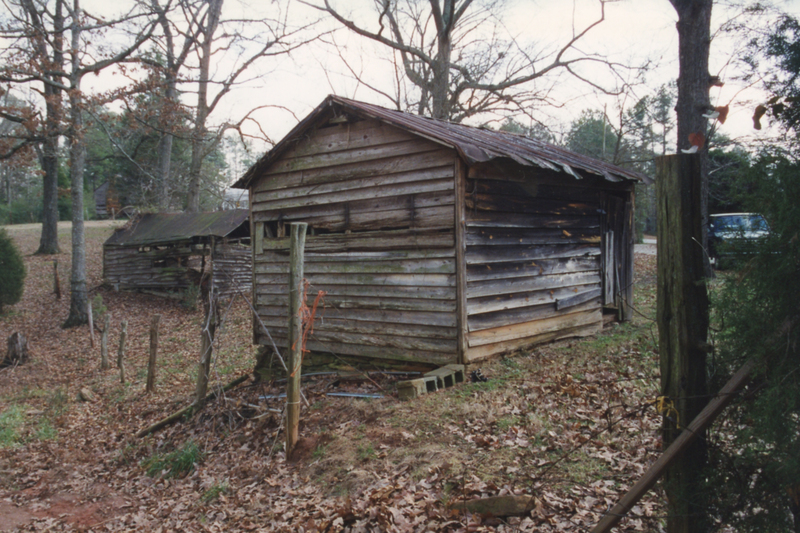 According to a recent study of historic farmstead architecture, the plan and form of these single-pen “cabins,” as they were often called, were “frequently attributed to English settlers from the Tidewater region.” Probably in the late nineteenth century, the original structure was extended about twelve feet to the east, creating its present two-room configuration. 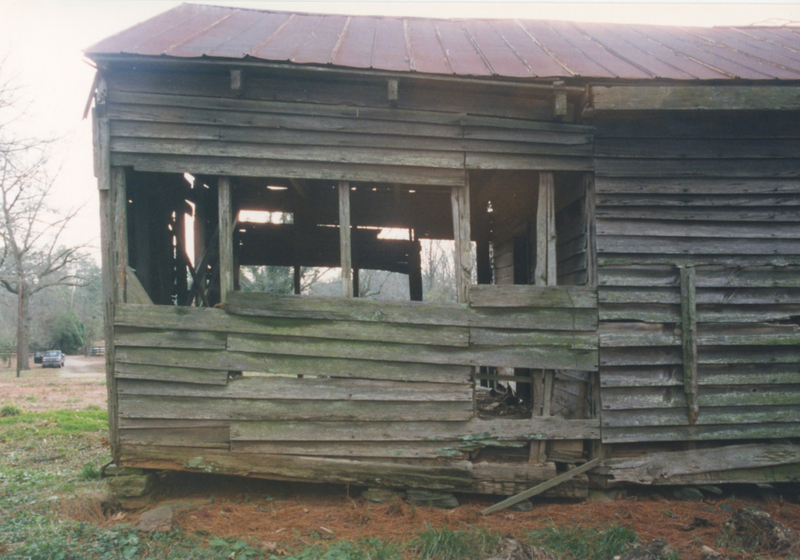 The original structure has a braced wood frame quite similar to that of the addition to the Post Office. 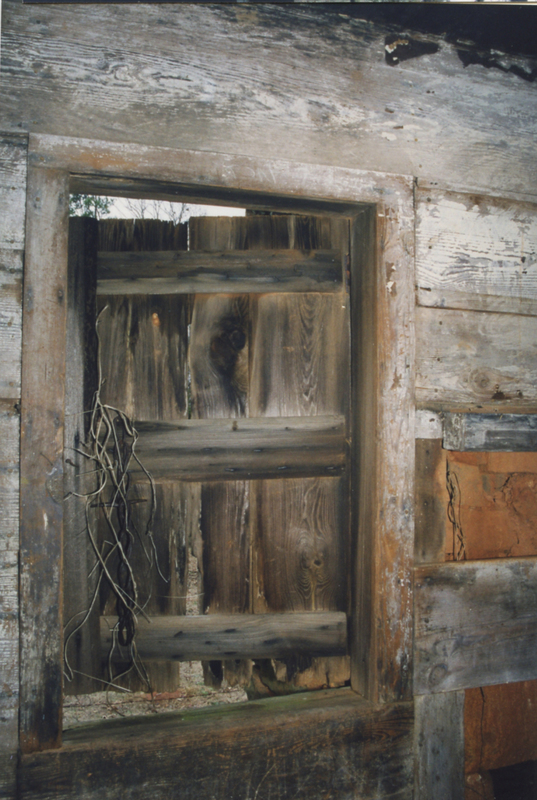 Exterior siding, interior wall and ceiling boards, nails and the character of the surviving door and window shutter also resemble those used on the addition to the Post Office. However, perhaps because the building was built as a residence, it has interior features not found in the Post Office. These include a 1” x 6” chamfered baseboard, a 1” x 2½” chamfered board installed as a crown mold, and ½” x ⅝” square molding in the corners of the room. The existing floor system uses 2” x 7”-8” joists and plain (not tongue-and-groove) floor boards. In addition, the interior of this room was white-washed. 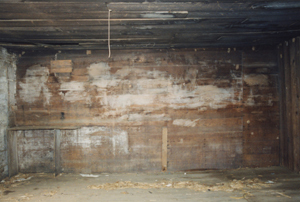 The tremendous amount of accumulated debris and the added shelves and partitions (all unpainted wood) within this space may still hide valuable clues to the building’s historic evolution. 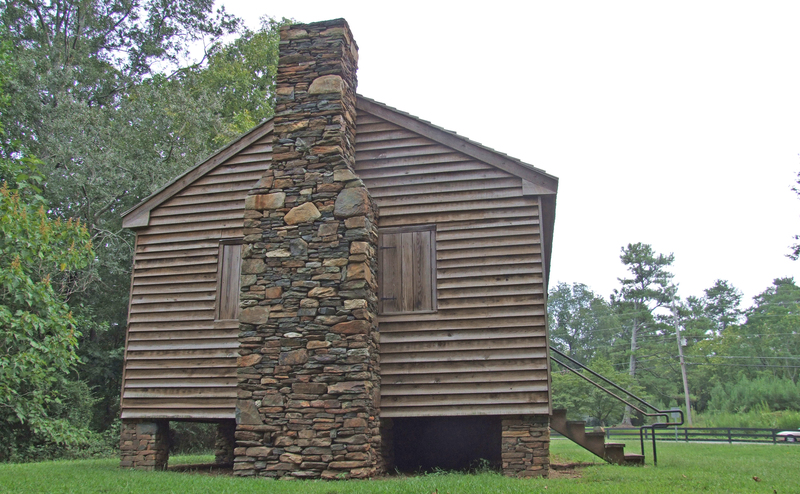 This building has a fieldstone fireplace and chimney that is similar to that on the Post Office. It, too, is deteriorating, with the large stone hearth cracked and several feet of the top of the chimney missing entirely. The mantle shelf is missing but the remainder of the fireplace surround is mostly intact. Doors and windows are quite similar to those in the Post Office. The two windows in the original building were closed only by board-and-batten shutters and the doors with doors that are quite similar to the board-and-batten doors used on the Post Office, utilizing tongue-and-grooved boards and wrought-iron strap hinges. 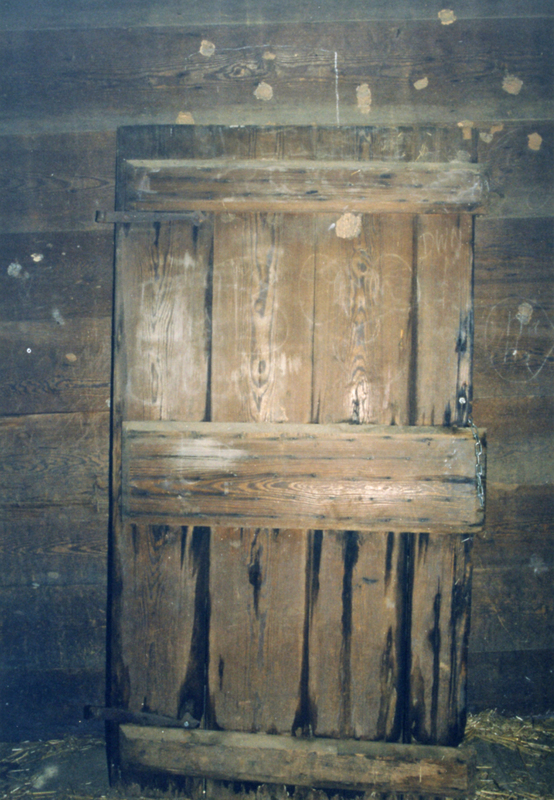 Only an interior wooden latch closed the doors. 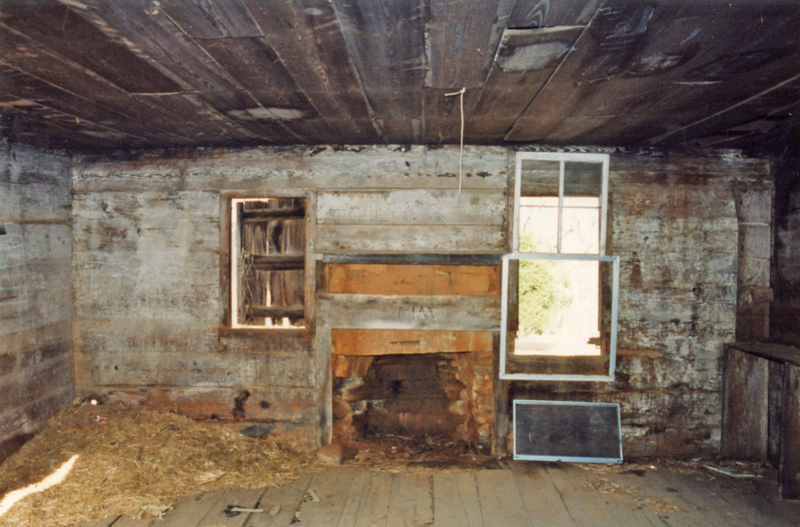 When the room was added to the east, the original clapboard siding on the east end of the one-room cabin was mostly left in place, including in the gable end. 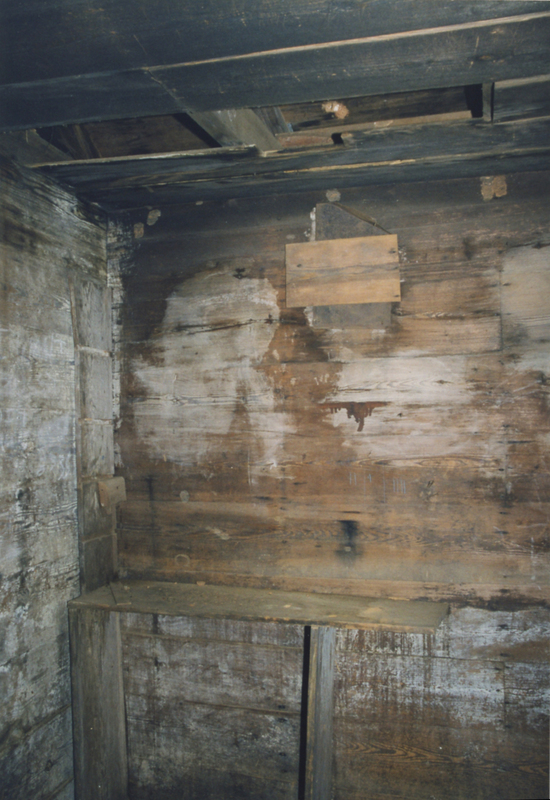 Although the three outer walls of this room have been completely stripped of all woodwork, except for part of the door casing on the south wall, nail holes indicate that the walls were probably finished with 1 x 10 boards. 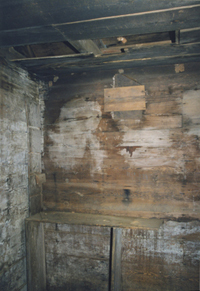 The absence of nail holes in the ceiling joists indicates that the room never had a ceiling, although it is possible that the original joists have been replaced. Figure 43. 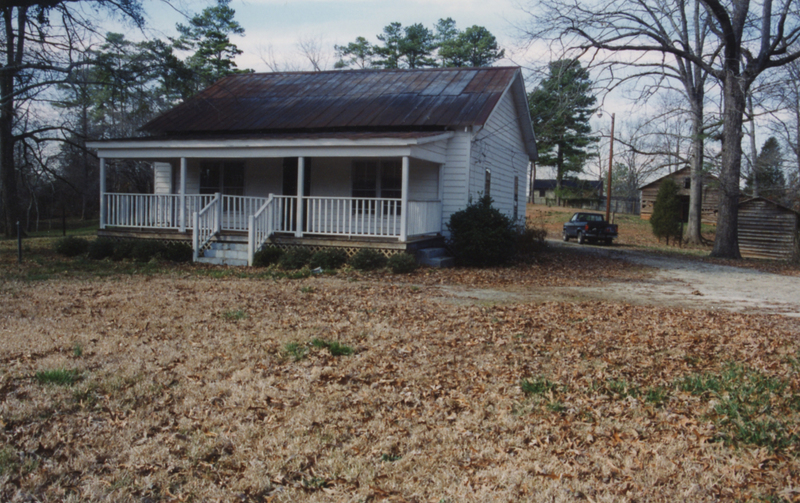 View north of original portion of Slave/Tenant House. Figure 44. 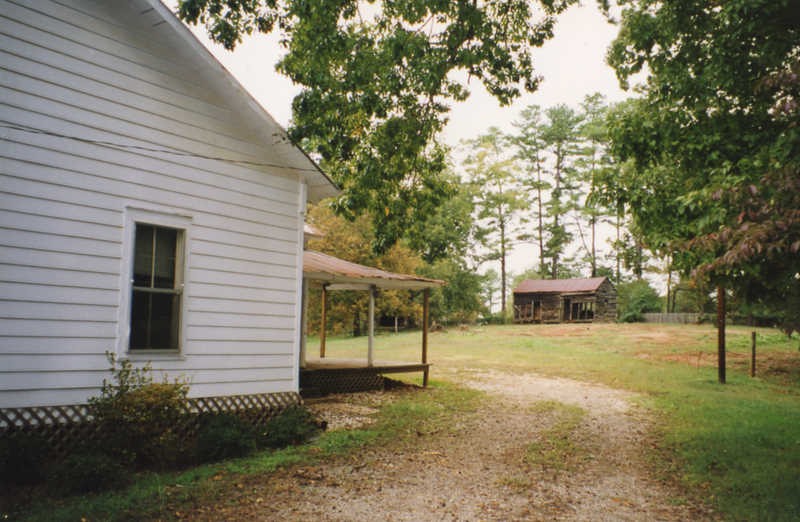 View north of addition to Slave/Tenant House. Figure 45. View south of addition to house. Figure 46. View south of original portion of house. Figure 47. View of southwest corner of house. Figure 48. View of west end of house. Figure 49. View northwest in original portion of house. Figure 50. View east in original room of house. Figure 51. View of inside of front door. Figure 52. View southwest in original room of house. Figure 53. View south in original portion of house. Figure 54. View southwest in addition, showing original east wall of house. Figure 55. View northwest, left, and east, right, in addition. Built by William T. Nash for his son Claude in 1913, the front porch had been altered before 1998. 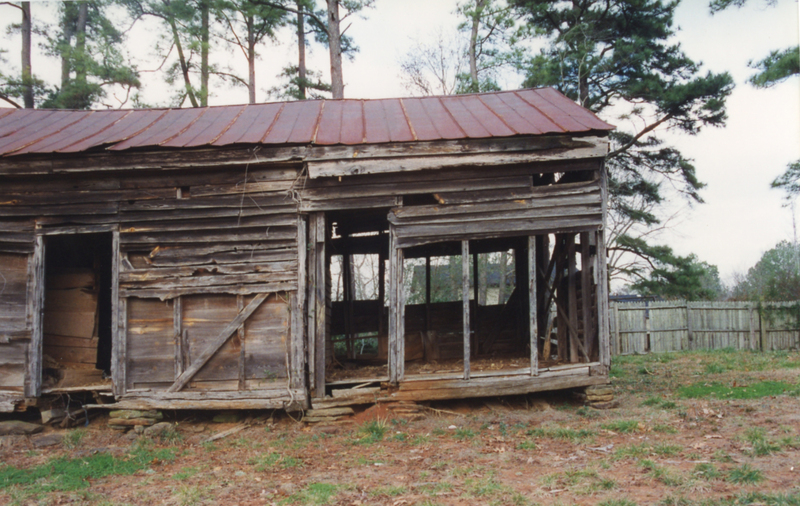 The house was removed after 1998. Figure 56. Claude Nash House from the south. Figure 57. Claude Nash House from the south. Figure 58. Rear of Claude Nash House from the southeast. 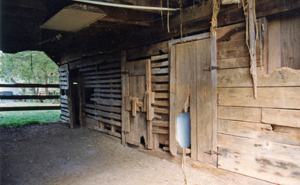 Located near the center of the north side of the property is the Barn that Claude Nash constructed about 1939. 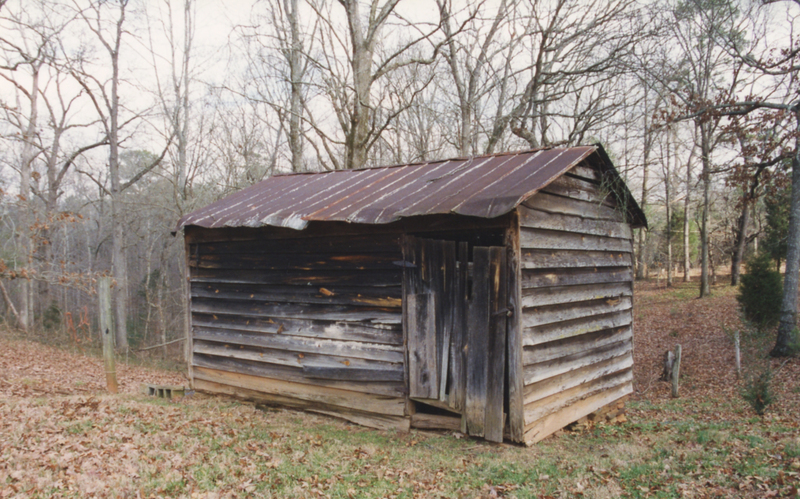 Prior to that time, Nash had used a log Barn located closer to the house. 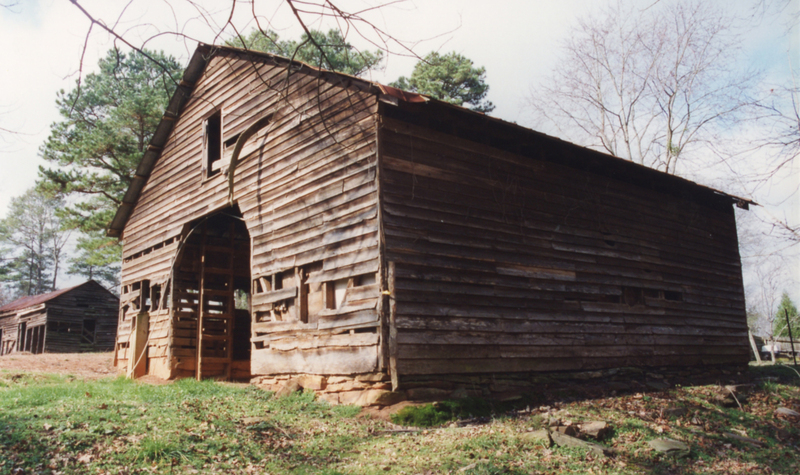 It is possible that that log Barn or “stable,” as his daughter remembers it, was a nineteenth century structure built by William T. Nash or by Thomas Hudson himself. It has been destroyed. Figure 59. 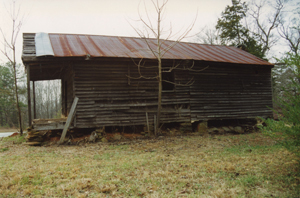 View southeast of Barn. Figure 60. View northwest of Barn. Figure 61. View north of center aisle of Barn. 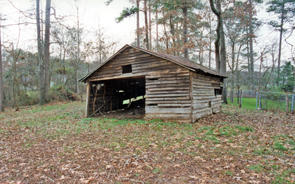 Approximately thirty feet square, the present building is a transverse-crib barn, perhaps the most common barn type in rural Georgia farms of the early twentieth century. It consists of a central aisle, oriented in a generally north-south direction that parallels the end-gabled roof, and is flanked by three cribs on each side. Built in part of what had been a garden area for the Nashes, the structure is wood-framed, has a metal roof and is set on a masonry foundation. The foundations for the cribs on the east side of the building are stacked stone, similar to that used on the wash house and, much earlier, on the original Hudson’s store. The foundation on the west side of the building, while apparently contemporaneous with that on the east, was constructed with poured concrete and stone. 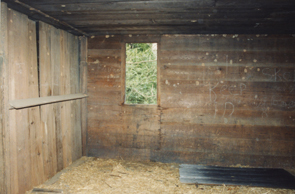 Due to the sloping site, the foundation for the cribs on the east side of the Barn are set approximately a foot below the ground level of the center aisle. 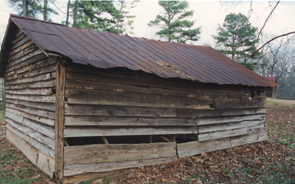 The structure contains a variety of materials, some of which are said to have been salvaged from what was probably one of Hudson’s original slave houses. In particular, the sills used in the southwest corner of the building contain mortises that are clearly from a building that was quite similar to the store/Post Office and the existing slave/Tenant House. 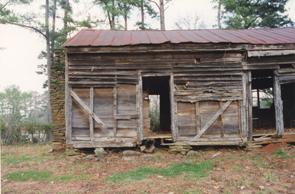 Many of the studs in the Barn measure about 3” x 4”, a dimension that was typically used in antebellum building, and the character of the other interior material suggests that much of it was salvaged. 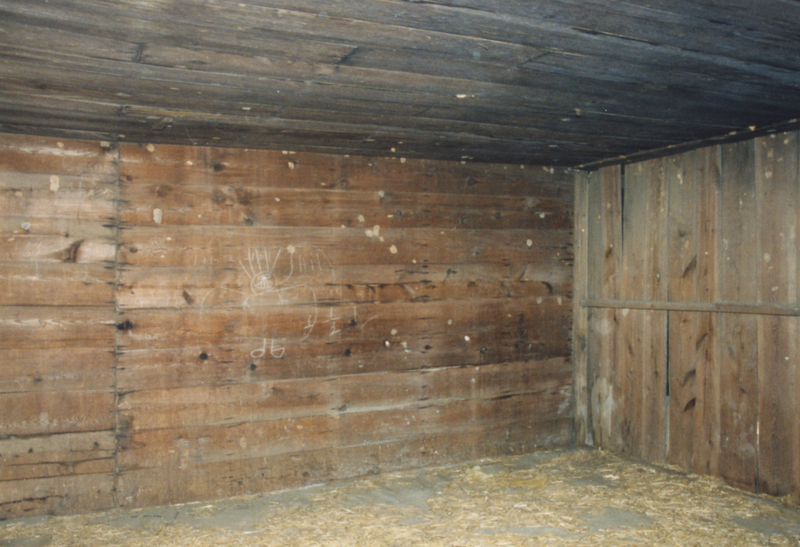 The crib at the southeast corner of the Barn is floored with 1 x 12s and was probably used for corn and feed storage. The other cribs are dirt floored and were clearly used to house livestock. 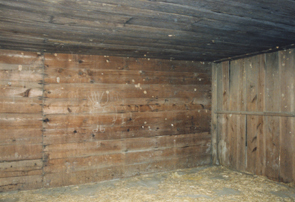 Three of the cribs still contain heavy board troughs for the animals. The attic of the Barn is floored with 1 x 12s and was, of course, used as a hay loft. Open above the center aisle at the south end and accessed by a wall-mounted ladder at that location, the loft was also lit by a 28” x 48” opening in each gable. Both of these openings were originally covered by hinged doors. 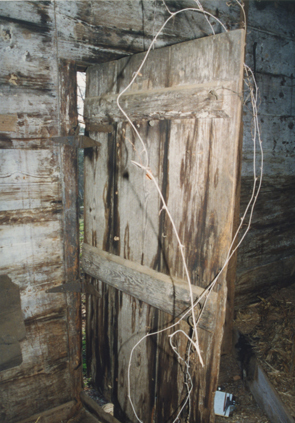 The Barn originally had double doors at the north end of the center aisle but only the hinges remain from these doors. The south end appears to have been closed only by hinged gates but these, too, have been lost. Hinges indicate that there may have been an additional set of gates about ten feet inside the south end of the aisle. These would have allowed the animals to be closed in the center aisle while still giving access to the feed room and hayloft. Each of the cribs is also closed by a door. 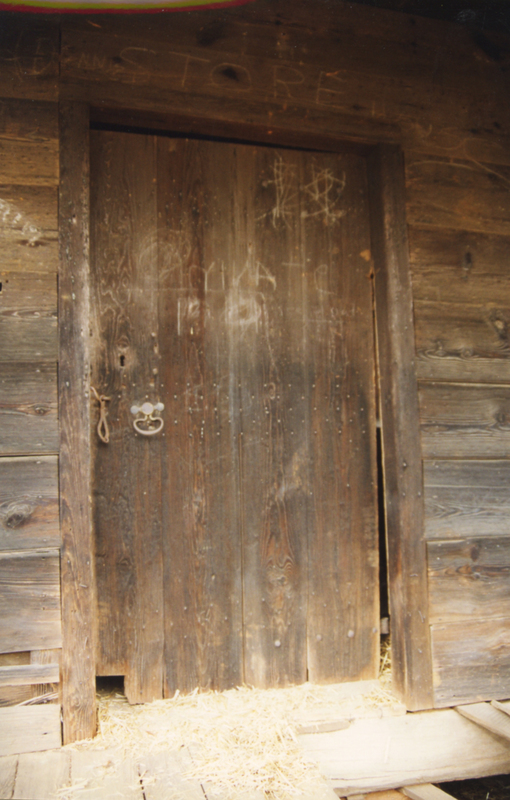 The large wooden latch mechanism and other closing devices on these doors are noteworthy. Located west of the Slave/Tenant House and facing in a southeasterly direction, the tractor shed was constructed shortly after World War II when Claude Nash purchased his first tractor. 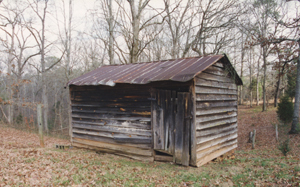 Wood-framed with sills set directly on the ground, the building has a dirt floor, wood siding, and a metal roof. In the southeast corner of the building are the ruins of a brick fire place which Nash used in his routine black smithing chores. Figure 62. View west of Tractor Shed/Blacksmith Shop. Figure 63. View east of rear of Tractor Shed/Blacksmith Shop. 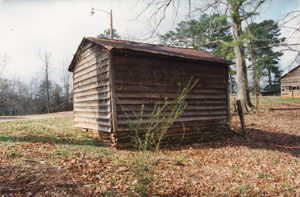 Located just to the northeast of the Nash house and facing in a westerly direction, the Wash House is a wood-framed building set on a low stone foundation at the rear and at both ends. The floor is concrete, probably installed after World War II, and the roof is sheet metal. At the north end, three runs of the clapboard siding have been attached to a wood frame, hinged at the top. This opening could be raised by a rope through the wooden pulley mechanism that is set in the peak of the gable at that end of the building. Mrs. Nash used this as a convenient way of emptying wash water when washing was still done by hand. Electrical connections and pipes laid in the concrete floor were installed after World War II when the Nashes began to use washing machines. Figure 64. 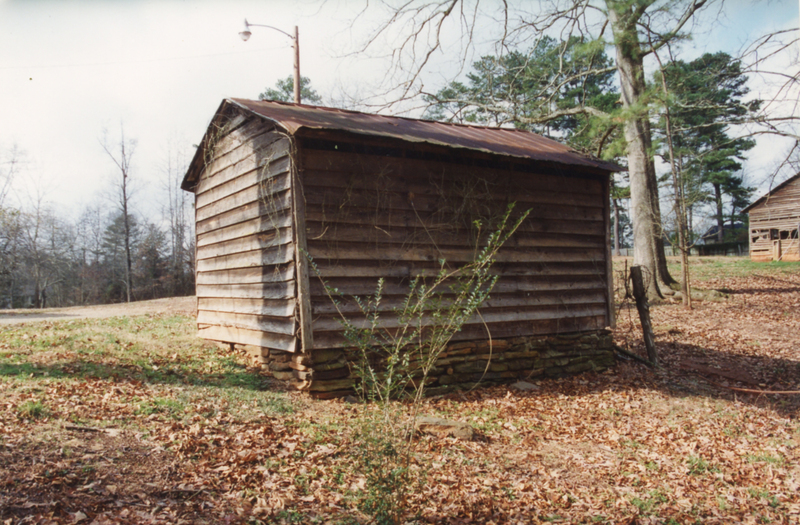 Wash House, looking northeast. Figure 65. 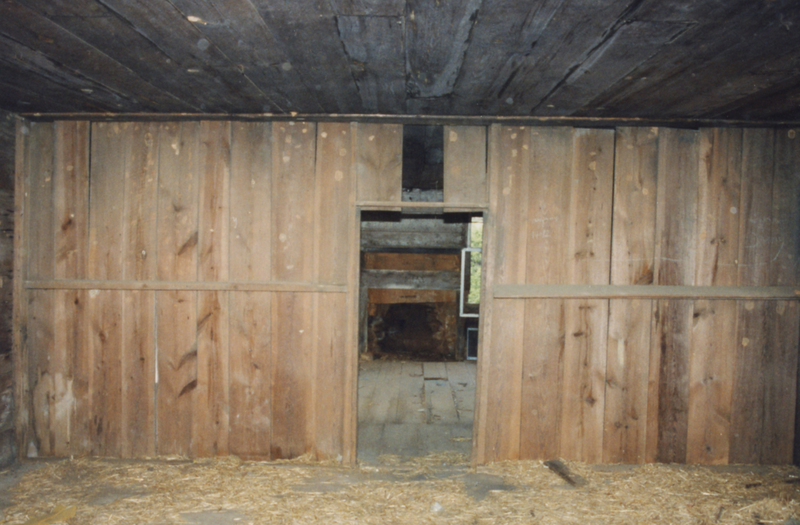 Wash House, looking southeast. Figure 66. Wash House, looking northwest. Figure 67. 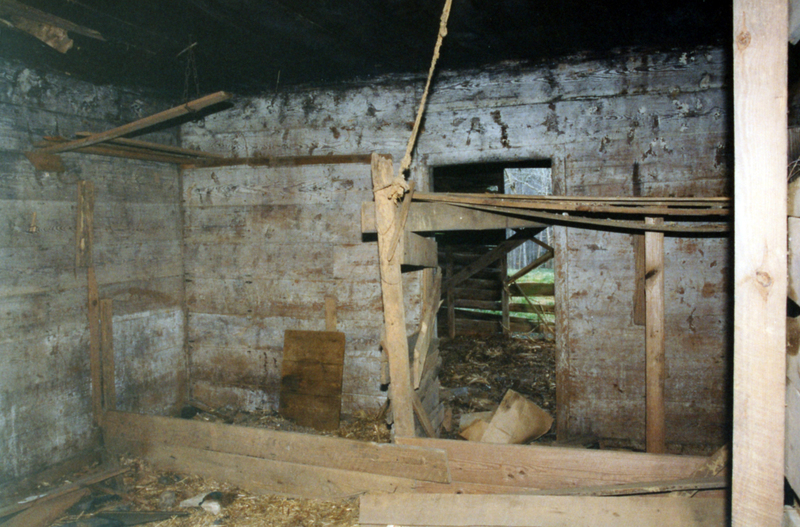 Interior of Wash House. 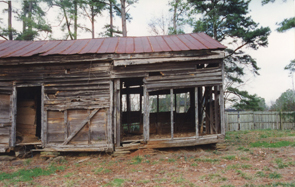 In addition to the main house and kitchen across the road and the storehouse/post office, and the two slave houses, Thomas Hudson no doubt built many other outbuildings around his homestead in the mid-nineteenth century, including barns, corn cribs, chicken houses, privies, and the other buildings that were necessary to operation of a farm in the mid-nineteenth century. 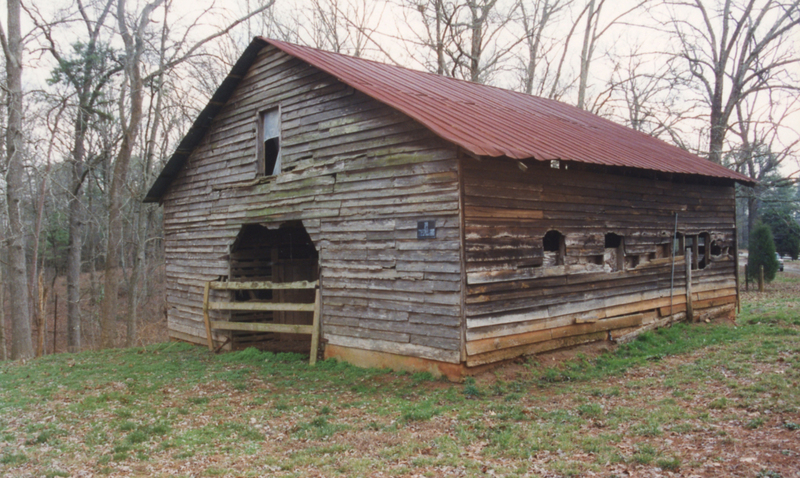 Although the Hudson’s chicken house and smoke house would have almost certainly been close to the main house across the road, at least some of these outbuildings may have been located on the north side of Five Forks-Trickum Road across from the main house in a type of farm layout that is well-documented in Georgia. 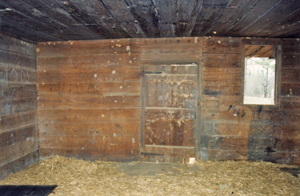 William T. Nash no doubt continued to use the farm buildings that Hudson had left, improving or replacing them as circumstances permitted or demanded, just as he did with the main house. The log “stable” that Hazel Nash Cruce remembers behind the Claude Nash house might have been built by Nash in the late nineteenth century or it could have been a hold-over from the earlier Hudson era, since log barns and outbuildings were a common feature across the Georgia piedmont. 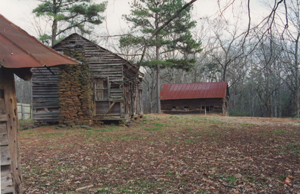 When Claude Nash began farming the present site after 1913, he, too, utilized the structures already on the property, but also added those structures necessary for his new house. These included the present Wash House, as well as a wood shed, chicken house, privy, and smoke house that have all disappeared. His last addition came shortly before World War II when he built the Tractor Shed and Blacksmith Shop just west of the Slave/Tenant House.